If you are a felt lover you have probably heard of Laura Howard. She is the talented lady behing the blog called Bugs and Fishes. You have to love Laura’s cute and inspired creations. Now and then Laura would share her talent with a tutorial. I have to say I literally fell for these felt vintage baubles. 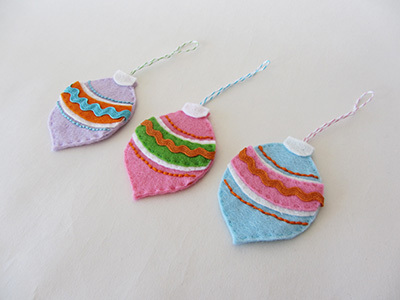 I loved making these ornaments, this is proper hand stitch therapy. The project calls fro yummy colours, and as always with felt the texture is soft under the fingers. Laura shares her tutorial for free. But if you want to sell the baubles you make, you would have to buy the pattern from her. This is what I did as I plan to sell these darling ornaments this week-end at the Chocolate Factory Christmas fair. Admit you can’t wait either!